A New Clear Threat - ZineWiki - the history and culture of zines, independent media and the small press. 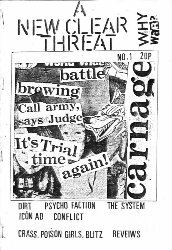 A New Clear Threat was a punk fanzine from Dublin, Ireland that was done firstly by PA and then by PA and Deko between 1981 and 1985. The subject matter of each issue included an intro, band interviews, some politics, and reviews. After the third issue PA’s friend Deko got involved as he had access to a photocopier; they would do 16-20 pages each and fill in the rest with lyrics and images. Both were playing in the famous Irish punk band Paranoid Vision at that time. A New Clear Threat was sold mainly in the local record shops of Dublin that sold zines, Freebird records and Base X. 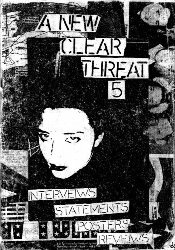 A New Clear Threat lasted for 5 or 6 issues until 1984/5. The band Deko and PA were in, Paranoid Visions, broke up in 1992 but reformed in 2005 and are still going with Deko and PA. This page was last modified on 30 March 2018, at 11:37.